Blair, R.. "Pig Farming". The Canadian Encyclopedia, 05 February 2019, Historica Canada. https://www.thecanadianencyclopedia.ca/en/article/pig-farming. Accessed 21 April 2019. Canada is one of the largest pork producers in the world. Pig farms are located primarily in the Prairies, Québec and Ontario. 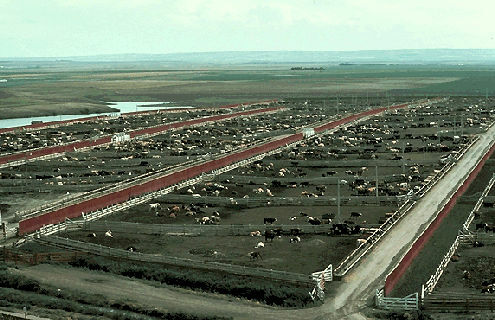 Lacombe hogs are the first livestock breed developed in Canada, at the Agriculture Canada Research Station in Lacombe, Alberta. Image: \u00a9 R. Blair. Pigs were first brought to what is now Canada in 1598 by a French nobleman, the Marquis de La Roche de Mesgouez, as part of his unsuccessful venture on Sable Island. Apart from wild game, pork was the most popular meat of early settlers. It could be preserved in heavy brine and was available as a meat source during the long winters. Most Canadian pig farms are located in the Prairies (Manitoba, Saskatchewan and Alberta), Québec and Ontario, as these areas produce grains and grain by-products for feed use. There were over 7,000 pig farms in Canada in 2013, varying from large operations that market several thousand animals a year, to small mixed farms marketing one hundred or less. Canada is among the top 10 pork producers in the world. Other major pig producers include China, EU, US, Brazil, Vietnam and Russia. In 2013, Québec was Canada's largest pork producer, exporting about 34 per cent of the country's overall production. There is a small organic pig industry in Canada (no statistics available). In 2013, nearly 21 million pigs went to market in Canadian processing plants. In addition, more than 800,000 pigs went to processing facilities in the US and over 4 million pigs went for feeding and finishing on US farms. In 2013, Canada ranked third among pig exporters, with about 18 per cent of world exports, after the US and the EU. These exports of Canadian pork, hams and bacon — or products such as offal — were sent to all continents, including Antarctica. There are five main swine breeds in Canada. Crossbreeding programs are recommended because they result in larger litters of more vigorous pigs, and yield market animals that grow faster and more efficiently. Yorkshire pigs originated in England and are all white with erect ears. The most numerous breed in Canada, it is noted for vigour, prolificacy and efficient feed conversion. Yorkshire sows commonly produce more than 10 pigs per litter. 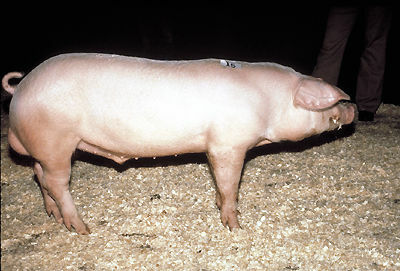 Landrace pigs originated in Scandinavia and are noted for prolificacy, good mothering ability and a lean carcass with a high proportion of ham. They are commonly crossed with other breeds, yielding hybrid vigour in the young. Duroc pigs originated in the US. All are red (golden to mahogany), with drooping ears, and have a good carcass and feed efficiency. The Duroc is a hardy breed, noted for large litters. Hampshire pigs were developed in Kentucky from pigs imported from Hampshire in England. They are black with a white belt around the shoulders (i.e., a saddleback) and exceptionally well muscled, although they are somewhat shorter than the Yorkshire and produce smaller litters. When used correctly in a crossbreeding program, Hampshire pigs yield superior carcass quality in the offspring. Lacombe pigs represent the first livestock breed developed in Canada, a hybrid of Landrace, Berkshire and Chester White. Developed at the Lacombe Research Centre in Lacombe, Alberta, the breed was first licensed in 1957. Pigs are all white with drooping ears. They have a slightly heavier bone structure and are a bit fatter than the Landrace. The breed is not as popular as in the past and Rare Breeds Canada has raised concerns about low numbers in the national pig population. A breeding sow or boar requires about one ton of feed annually. 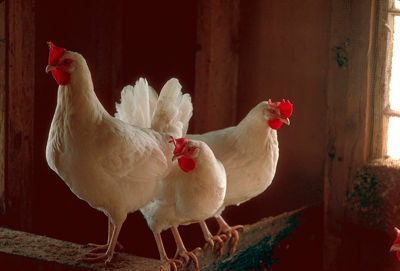 The market pig converts feed to weight gain with an efficiency of about 3:1; that is, more efficiently than beef cattle but less efficiently than broiler chickens (see Poultry Farming). A market animal weighing 100 kg typically yields about 80 kg of trimmed carcass following slaughter and evisceration. Carcass quality and price paid to the producer are determined by an index that reflects lean meat yield. Slaughtered animals must be disease-free and are inspected by government veterinarians. Canadian pork is produced under a high-standard “health of animals” program (see Commodity Inspection and Grading; Food Legislation; Veterinary Medicine). Since 1937, the industry has access to a uniform national testing system. It provides producers with a basis for assessing their breeding stock using techniques such as ultrasonic recording of fat measurement in live animals. Canada implemented a national hog carcass classification system in 1986, making it one of the first countries to do so. All of the processing plants are subject to inspection by either federal or provincial government agencies to ensure that the regulatory requirements are met. Pig processing provides more jobs than cattle processing, since two-thirds of the meat is sold in processed rather than fresh form. According to the Canadian Meat Council, the average Canadian consumes over 12 kg of pork products per year. This compares with almost 13 kg of beef and about 15.5 kg of poultry. Pork is now much leaner than it was in the past. Pork loin centre cut, the source of many chops and roasts, is 42 per cent leaner than in 1987. All raw, fresh pork cuts, except spareribs, qualify as lean when trimmed of visible fat, since they contain less than 10 per cent fat. This reduction in fat content was achieved through improved breeding and feeding programs, a revised grading system that rewards pork producers for producing leaner meat, and better trimming of fat at the processor level and in grocery stores. The Canadian Pork Council (established in 1966) represents pig producers and is a good source of information on the industry and its products. Hog ProductionThe latest statistics for Canada's hog farming and processing industry. From Statistics Canada.